AZUSA, Calif., July 26, 2011 -- Northrop Grumman Corporation's (NYSE:NOC) Azusa campus recently concluded its year-end activities for the company's WORTHY (Worthwhile to Help High School Youth) program with an annual science/engineering competition and an awards dinner. WORTHY is a mentoring program designed to encourage student interest in the science, technology, engineering and mathematics (STEM) fields and to pursue technical degrees. This serves the long-term goal of developing enough scientists and engineers to meet future industry employment needs. Initially launched in 1997 by Northrop Grumman in Baltimore, the WORTHY program has expanded to include additional company locations around the country. The 7 th Annual WORTHY competition challenge was held on May 17. This year's project was to construct a "Da Vinci Launcher," so named based on the concept of blending art and technology. Students from Azusa High School and Gladstone High School, assisted by Northrop Grumman employee mentors, were tasked to design a launcher that could hit a target consisting of three concentric circles, with the largest being four feet in circumference, from distances of 10 feet and 20 feet. Each team had 90 seconds to fire 20 projectiles. The goal was to hit the target the most times within the time allotted. Azusa Unified School District officials were on hand to judge the competition, which involved five teams consisting of 19 students and 20 mentors. Teams were judged based on criteria such as design ingenuity, aesthetics and simplicity. This year, "Team Delicious," comprising students from both high schools, was named the winner. 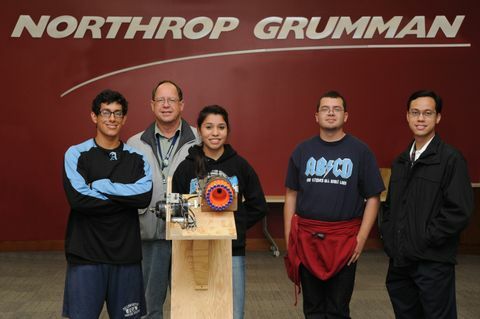 "Azusa High School is truly grateful for Northrop Grumman's commitment to students," commented John Steven Coke, Sr., Principal of Azusa High School. "The WORTHY program provides students with hands-on experience supported by some of the top engineers in the country. We look forward to continuing our partnership with a company that cares about students." The year-end celebration dinner was held on June 2 for the WORTHY students and their families, sponsored by Northrop Grumman. The students presented overviews of their projects and shared lessons learned during the program. Along with recognizing the WORTHY students, this year's recipients of the Northrop Grumman Engineering Scholar awards were also honored. "Students in the WORTHY program are introduced to fundamental engineering principles in a way that nurtures their interest in the STEM fields," said Stephen J. Toner, vice president of Northrop Grumman's Azusa Operations. "Providing an environment that cultivates creative thinking and improved problem solving skills will help form a solid foundation to build upon as the students pursue careers in the technical fields." WORTHY students receive hands-on engineering-related experiences along with mentoring, networking and on-site guidance. Students who meet the rigorous requirements of the program are eligible for college scholarship aid from the company. Since its inception in 2004, a total of 40 students have participated in the WORTHY program at Northrop Grumman's Azusa facility. To be accepted into the WORTHY program, rising high school sophomores must attend a Northrop Grumman-partnered public high school, maintain a 3.0+ grade point average, complete an application, submit an essay with two letters of recommendation, and be selected through an interview process. The program runs during the school year and requires a two-year commitment.